■ There are a few important technical caveats to facilitate laparoscopic radiofrequency ablation. ■ Ultrasound is essential to localize the tumor and to gauge the deployment of the times during laparoscopic radiofrequency ablation. ■ However, monitoring the ablation lesion is not necessary, because setting the tines to the desired diameter on the probe handle will ensure appropriate heat distribution to the tumor (27). Only dissection of Gerota's fascia is necessary to expose the tumor surface. Hilar dissection is unnecessary, which minimizes the risk of vascular injury. A separate abdominal wound should be made with a No. 11 blade to allow perpendicular trajectory of the radiofrequency ablation probe into the center of the exposed renal tumor. If necessary, some perirenal fat or laparoscopic pledgets can be used to prop the kidney up to optimize probe angle. Track ablation should be utilized while removing the probe from the tumor on completion of the ablation. 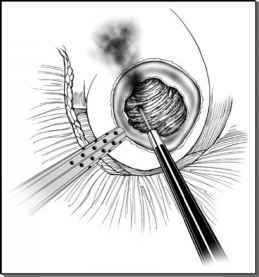 Finally, we recommend injecting fibrin glue down the ablation track for tumors that are close to the collecting system. This may prevent urine leaks.